Residents in Finland are taxed on their worldwide income. An individual becomes a resident of Finland if he has a primary residence in the country or he is continually present in the country for more than six months. Married couples are taxed separately. Residents in Finland are liable to pay tax on their worldwide income. Taxable income is divided into two categories: (1) income from capital and (2) earned income. The categories are taxed separately at different rates. Income from capital includes any yield from capital investment, dividends, interest, capital gains and rental income among others. Taxable income is generally computed as gross income less income-generating expenses. Tax on capital income is levied at progressive rates. Rental income falls under income from capital and is taxed at progressive rates, from 30% to 34%. Income-generating expenses, such as maintenance, renovation and interest (provided it came from a loan used to acquire income) are deductible from rental income before the tax is imposed. Gross selling price less 20% (40% for property owned at least 10 years) in lieu of actual acquisition costs. Gains from the sale of a dwelling are exempt from capital gains tax, provided that the dwelling was used as a permanent residence of the owner continuously for at least 2 years during the period of ownership. Gains that do not exceed €5,000 are exempt if derived from the sale of household effects that have been in owner´s personal or his family´s use. If the proceeds of the sale of a property do not exceed €1,000, they are also exempt from tax. Salaries, wages and any other compensation for work fall under this category of income. Taxable income is calculated as gross income less allowable deductions. Individuals with earned income are also liable to pay municipal income tax and church tax. Aside from the progressive national income tax, earned income is also subject to municipal income tax. Municipal income tax is levied at varying rates, between 16.50% and 22.50%, depending on the municipality. For Helsinki, the rate is 18.5%. Additional deductions and allowances are available for this tax, aside from the ones given for the national income tax. Members of the Evangelical Lutheran Church and the Orthodox Church are liable to pay church tax on their earned income. Each parish is responsible for annually determining their respective tax rates. The tax is levied at flat rates ranging from 1% to 2.20% depending on the municipality. In Helsinki, the Evangelical Lutheran Church income tax rate is 1%, and the Orthodox Church income tax rate is 1.6%. 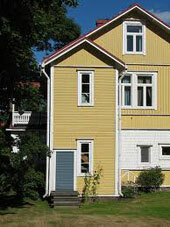 A real estate tax is levied on properties located in Finland. The actual rates are established by the municipalities, which are the recipients of the revenue from this tax. The tax is imposed on the value of the property. Tax rates vary in different municipalities, ranging from 0.41% to 6%. Corporate income and capital gains are taxed at a flat rate of 20%. Income-generating expenses and other business-related expenses are deductible from gross income.